Today, the Iberian Peninsula is a key part of the European continent through its blood and culture, as well as its history that has made the Strait of Gibraltar more than a mere geographical location. How this came to be is the subject of this article. Iberia has been home to two empires that nearly dominated the globe, but during ancient times it was once an isolated region considered a frontier by various peoples such as Celts, Phoenicians, Greeks, and Romans. This Isolation made the peninsula home to some of the last remaining indigenous Old European nations until its unification under Roman Conquests. These conquests have left a cultural and, to a degree, genetic imprint on Hispania. Today, only the Basque remain very akin to their pre-Indo-European ancestors; they are genetically different from their French and Spanish neighbours and speak a language that has no Indo-European roots but is most surely of Old European origins. 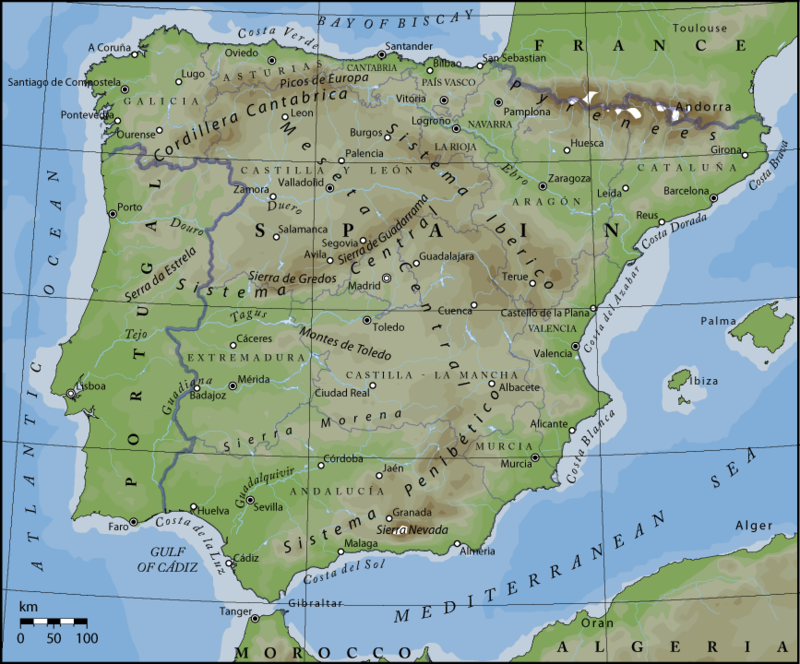 The Iberian Peninsula during the Ice Age had several areas on its Mediterranean coast that remained quite mild compared to the freezing cold of the European Continent. This allowed for some of the oldest human populations to live there, such as the Cro-Magnon, until the advent of the Neolithic Farmers. Neolithic Farmers were one of the most successful populations to arrive in Europe. Originally from the Near East, they brought agriculture with them, and while they expanded through most of Europe, it is in the Mediterranean where they thrived, including the Iberian Peninsula. These Neolithic Farmers would have also intermingled with the Mesolithic population already there. In Iberia, the Neolithic Farmers would have arrived from two different routes— one from Europe and the other across the Gibraltar from North Africa, colonizing Northern and Southern Iberia respectively, bringing with them plenty of genes that still appear today among the Spanish and Portuguese. In Late Neolithic and Copper age Central Portugal, the Bell Beaker Culture was born. It would spread across most of Western Europe— from Southern Spain to Denmark, and from The British Isles to modern Czechia. The Bell beaker phenomenon was mainly a multicultural trade network that coincided with the Megalithic culture and was greatly influenced by the Indo-European peoples who had already made their mark on the rest of Europe. The wealth of this Megalithic Culture with the Bell Beaker network likely made it a target for the invading Indo-European-speakers at their Eastern boundary. These warrior peoples that we descend from conquered, replaced, and intermingled with the local populations of vast areas of Western Europe. These Invaders were, for a long time, stopped from advancing into the peninsula by the Pyrenees Mountains, but from 1800 BCE on bronze artifacts in Copper Age societies began to appear, likely from Proto-Celtic adventurers or a ruling elite. The existence of such a ruling population would explain why the mainly non-Indo-European Basques have by a very large margin R1b paternal ancestry, a y-haplogroup characteristic of Western Indo-European peoples. However, it wasn’t until the expansion of the Urnfield Culture in 1300 BCE from Central Europe into North-Eastern Spain and then the Hallstatt culture from 1200 to 750 BCE that the Indo-European speakers made a bigger appearance and began to leave genetic imprints that exist in Iberia until today. Yet it is during a great Celtic Expansion into Iberia that most of the impact was done. As these Celts colonised large areas of the peninsula during 500 BCE, they made R1b the predominant y-haplogroup in Spain and Portugal, though their impact has had a much less substantial impact on maternal lineages. The Lusitanians are an odd folk among the Celtic and Iberian peoples of the area. They are attested to have lived in roughly what is today the Alentejo region of Portugal, and to have spoken an Indo-European language. Whether they were a Celtic culture with heavy pre-Celtic influences or a pre-Celtic culture with a noticeable amount of Celtic influence is still debated, with even one theory suggesting that the Lusitanian language was Italic due to the relation of Lusitanian deity names with other grammatical elements of the area. Within the region inhabited by the Lusitanians and Celtic Callaeci, the worship of gods named Bandua, Cosus, Nabia, and Reva is documented. Bandua is proposed to be a god of oaths and deals from the root *bendh (to bind or to fasten), but other authors don’t exclude a possible association with water that would explain several hydronyms and Bandua’s relation with fords. In the Southwest next to the Lusitanians the Celtici, and in the northwest of the Peninsula is where most of the typically Celtic toponyms are found, such as place names ending with –briga. It is here where we can find the recognizably Celtic people— the Callaeci, Astures, and Cantabri that have given name to the regions of Galicia, Asturia, and Cantabria respectively. Among the most relevant Pan-Celtic deities in Hispania, we can find Epona, the goddess of horses, who has been attested in Cantabria. Various ethnonyms and toponyms related to Lugus (Lugh, the Wanderer in the Celtic Pantheon) with perhaps him being the basis for the city of Lucus Augustum in Galicia that today is known as Lugo. The Matres also appear in Celtic iconography predominantly in the Cantabrian region. Additionally, many toponyms that might allude to the Celtic god of thunder Taranis, such as Tárano, Taranes, Taraniello, Taranillo, and Taraño, have been recorded in Asturias and its surrounding regions. At the time of the Celtic invasion, the pre-Indo-European Iberians on the eastern coast who would likely have spoken a language related to Basque, had a higher level of urbanisation than the Celts. Meanwhile, these Old Europeans observed the various colonies appearing all over the southern and eastern coast made by the relatively more urbanised Greeks and Phoenicians. Agadir, now called Cadiz, the oldest continuously inhabited city in Western Europe, was founded on the Iberian southern coast during this period. These colonies would have a small genetic impact on the population but a moderate impact in terms of culture, with the worship of Phoenician deities such as Tanit, Ba’al and, Melkart or the Greek Artemis, Demeter, and Asclepius spreading outside the colonies with their artistic style. Today however, little is known about the gods and goddesses of the Ancient Iberians. The goddess Ataegina, to whom several inscriptions were found, appears to be of Celtic Origin linguistically (the two roots *atte- and *geno- to mean reborn) and through her association with the Roman Proeserpina or Persephone (made by some epigraphs). This connection seems indicate her to be a deity of spring and the seasons. Some deities worshiped in Iberia by pre-Indo-European peoples, would be the war god Carioecus, the healing deity Batatun and a goddess associated with the Earth depicted in Lady of Baza. Animals of religious importance to the ancient Iberians would have been horses (with an important sanctuary for them found in Murcia), bulls (representing strength and virility who might have left in their legacy the cultural importance of bulls in Spanish culture), lynxes (linked to the world of the dead), vultures (who would carry the souls of the dead soldiers) and wolves. The Iberians were militaristic tribes that would partake in something reminiscent of ancient guerrilla warfare very frequently amongst themselves. Their soldiers would be used as mercenaries by Carthage later, especially the excellent Iberian Cavalry. As the Ancient Iberians would be in the East and Celts would be in the west, the Celtiberians would appear in the Northern Centre-East, being as the name implies a Celtic and Ancient Iberian entity comprising elements of both peoples. Their boundaries aren’t known with exactitude as different accounts place encounters all over central Iberia, but it can be asserted they lived mainly inland, west of today’s Catalonia and Valencia. After the First Punic War finished in 241 BCE, the defeated Carthaginians were in a massive debt from their usage of mercenaries, and saw the Iberian Peninsula as an apt place to expand and gather wealth from. Expanding is what they did by conquering and sometimes allying with the locals under the lead of Hamilcar Barca and later Hasdrubal, who would found the city of Qart Hadasht, New Carthage, today Cartagena on the southeastern coast. With Hasdrubal’s assassination, the well-known Carthaginian general, Hannibal, assumed command and lead his troops to conquer half of the peninsula until the Siege of Saguntum. Because this city was allied with the Romans, this siege brought the Second Punic war that the Romans won in spite of their many losses. 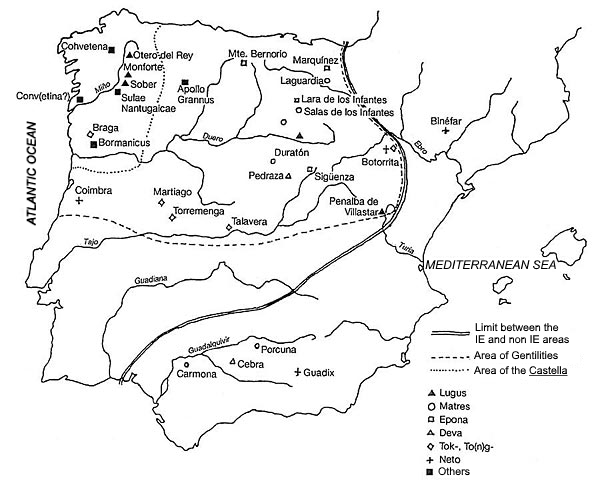 As condition of Roman victory, the former Carthaginian territories in Iberia became newly Roman. The Romans divided their newly acquired territories in the peninsula into Hispania Ulterior (Southern Spain) and Hispania Citerior (eastern/northeastern Spain) in 198 BCE, but in 196 BCE Hispania Cilterior had a raging revolt against the Romans which required the intervention of several Roman high authorities, including Cato the Elder. With an Iron Fist, he pacified the region— or at least that’s what he claimed. After his campaign, an important resistance in the area continued to exist that would cause the First Celtiberian War during 181-179 BCE. The Celtiberians would be defeated, yet another war would still happen with the Second Celtiberian War. 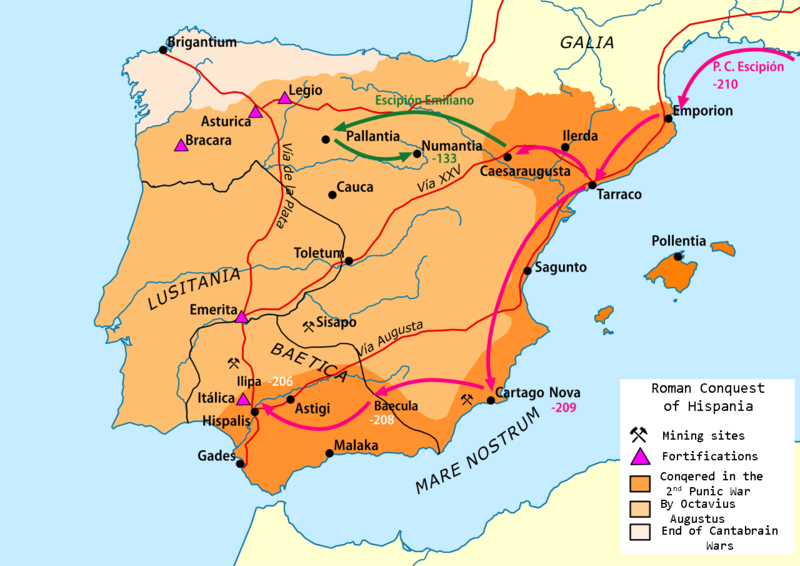 This chain of events only made Rome keen on expanding towards the rest of the peninsula to pacify the region for once with the fierce and bloody Lusitanian war— as the name implies between the Romans and the Lusitanians of Western Iberia. The Lusitanians were resilient warriors. They resisted the Roman Invasion for decades, as the Romans were conquered the west in the Numantine war and Third Celtiberian War against the last hold of the Celtiberians, Numantia, in 143 BCE. In 135 BCE, Scipio was reappointed Consul under popular demand to finish the war against the Celtiberians. In 134 BCE, he laid siege to the Stronghold of Numantia that would fall the next year, after a failed counterattack and negotiations, with the Numantine Chiefs committing suicide and the locals being sold into slavery. The siege of Numantia has been recorded by several Romans and inspired many Spanish works. There was a play written about it by Cervantes, the author of Don Quixote. The end of resistance against Romans, however, happened with the Cantabrian Wars of the Romans against the Cantabrians and Astures from the rugged terrain of the Northern Spanish Coast. These warriors of Celtic origin couldn’t withstand the Roman advance, and in 19 BCE, Augustus unified the whole peninsula under Roman rule and reorganized the provinces. He commissioned the Via Augusta that would go from the Pyrenees to Cadiz, across the whole of Iberia from north to south. While it's hard to see what genes are Roman or not due to the size and diversity of this empire, it can be attributed that perhaps up to 15% of paternal lineages are of Roman origin— especially on the Mediterranean Coast and southern Spain which is where the biggest Roman cities existed in the peninsula. The Romans would continue to dominate and Romanise the peoples of Iberia until the decline of the Roman Empire and the beginning of the Migration Period, when several tribes of Germanic origin dispersed across formerly Roman territory. 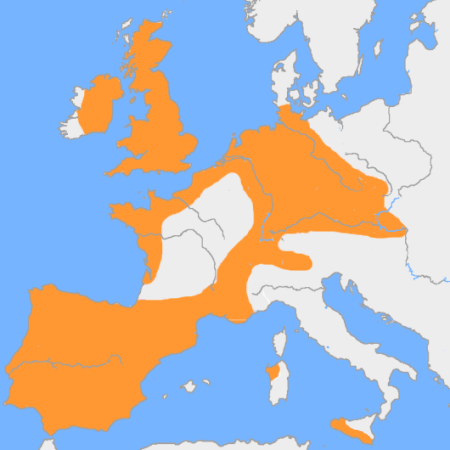 The Land south of the Pyrenees wasn’t an exception, as in the year 409 CE, the Suebi under King Hermerico invaded the northwest of the Iberian Peninsula (Roman Gallaecia). Later, in 411 CE, a treaty with Western Roman Emperor Flavius Augustus Honorius granted Lusitania to the Alans, Gallaecia to the Suebi and Hasdingi Vandals, and Baetica to the Silingi. Yet in the year 429 CE, after constant conflicts between Vandals and the Suebi, the Vandals and Alans left the peninsula for North Africa. 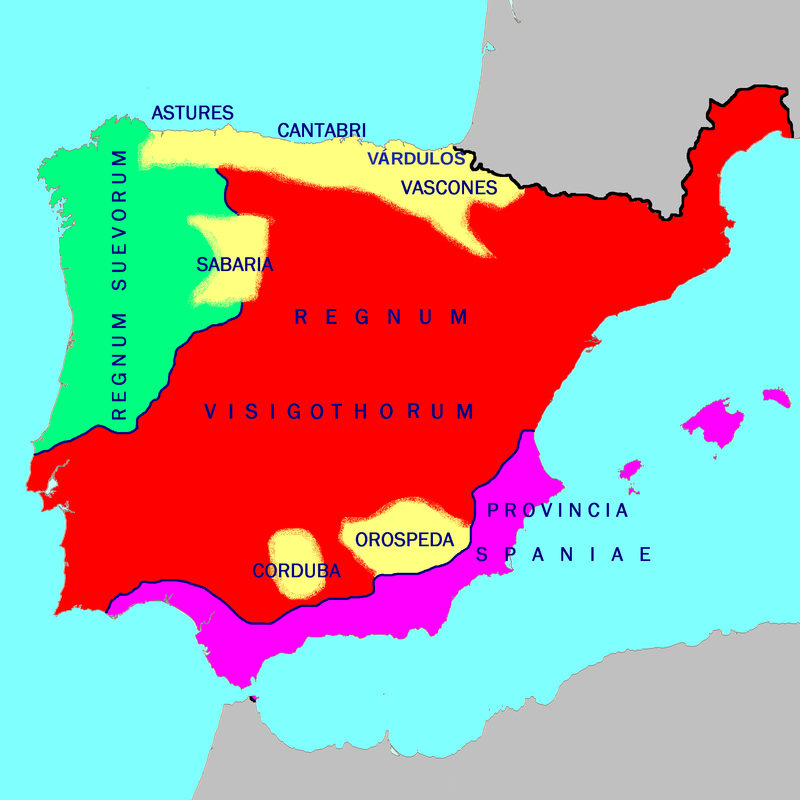 Then, in 454 CE, the Ibero-Roman population asked for Visigothic help against the frequent Suebi incursions. Two years later, lead by Theodoric II, the Visigoths beat the Suebi at Orbigo, sacking the Suebi capital, Braga. 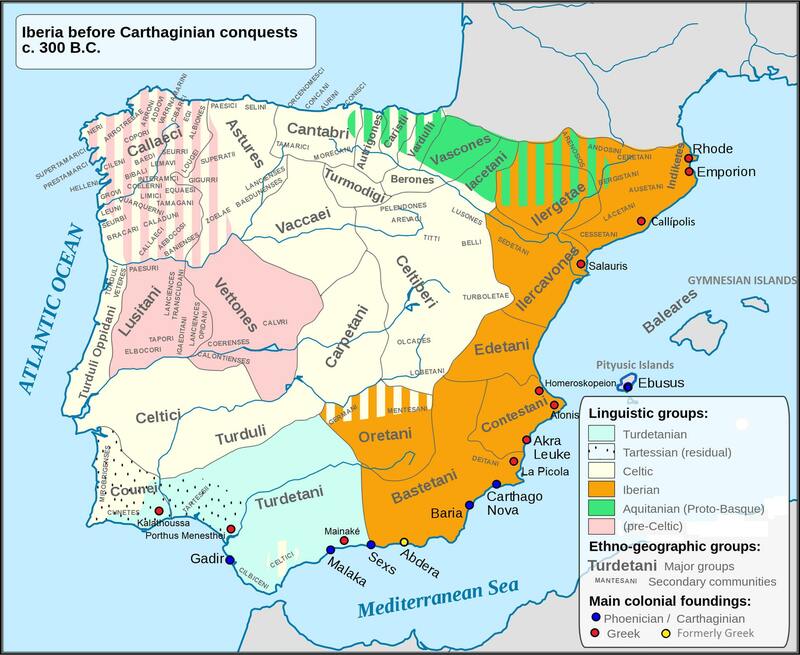 The Visigoths would cement their power in Iberia in the year 475 by forcing the Western Roman Empire to grant the Visigothic Kingdom full authority, after King Euric unified the various quarreling factions within the realm. The Visigoths were now the most powerful of the successor states after Rome’s fall in 476, and would gradually expand their authority to the rest of Iberia and areas beyond the Pyrenees until ruling the entire peninsula in 624 CE, after their conquest of the Basque and last Byzantine forces. When it comes to genetic impact, despite the success of Rome and later Germanic Kingdoms, the Germanics in Iberia were mainly ruling classes (and in the Visigothic case they had mixed a lot with non-Germanics on their way) and their genes probably amount to no more than 1% of the Spanish and Portuguese genepool with maximums of maybe 3% or 4% in the formerly Suebi (who remained for the most part unaffected and settled in the tens of thousands originally) regions of northern Portugal and Galicia. While with Rome it's hard to see what genes are purely Roman due to being present in other Mediterranean populations, it can be attributed that perhaps up to 15% of paternal lineages are of Roman origin, especially in the Mediterranean Coast and southern Spain, which are the oldest territories under roman control and the ones they had the most influence in. However, 60% of Portuguese and 50-85% of Spanish paternal lineages are of mostly Proto-Celtic and Hallstatt Celtic origins, in contrast with the maternal lineages that are predominantly Neolithic and Mesolithic always making more than half the percentage all across the Peninsula. The genetic landscape of Iberia today is quite uniform for its eventful history and rugged terrain. All the Iberians but the Basque cluster together between the French and Italians. This process of relative homogenisation occurred with Spain and Portugal, being most of their long histories entities without frequent internal conflicts compared to other European nations which led to interregional families. That, and the Reconquista where formerly Moorish areas were repopulated by northern Spanish Kingdoms that fought to defend the peninsula against Muslim Arab/Berber occupation. Near Eastern and North African DNA is prevalent at minor percentages throughout most of western Spain, but it does not have a unique origin and is the sum of all peoples with those genes that have lived in the region since the earliest populations that came with the Neolithic farmers until the Phoenicians, then the Arab and Berber occupiers, as well as the people with these genes that already lived among the Greeks and Romans who set up colonies and conquered the peninsula respectively. South Asian DNA represents a maximum of 12% of genetic makeup in Southwestern Iberia, while Catalonia at the other geographical end is nearly devoid of it. North African DNA makes up an average of 5% of western Iberian DNA while being 1-2% of Eastern one. Because the Spanish and Portuguese during and after the Age of Discovery forged large colonies where today some Euro-descendant populations still remain for the most part without native or African admixture, these descendants have given the Iberian World a larger scope— not only in cultural aspects but also in ethnic ones. This article is dedicated not only to those who live between the Strait of Gibraltar and the Bay of Biscay, but also to those who have retained Hispanic ancestry or are in some key part Indo-Europeans so they can hopefully themselves learn a bit more about this land’s sometimes convoluted, sometimes heroic history at the edge of the continent but well within Europe. 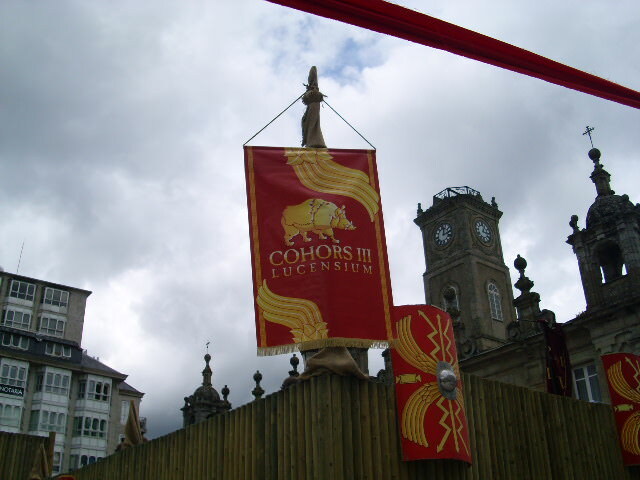 Finally, as somewhat of a side note but very related to the legacy or Romans and Celts, while looking for information and sources I stumbled upon the “Arde Lvcvs,” a festivity from Lugo in Galicia that happens every year during the last weeks of June to revive the city’s Romano-Celtic past and day of foundation as “Lucus Augusti.” This festivity concurred by hundreds of thousands of visitors has some interesting bits, whether they're accurate or not, that show how Romans and the Celts have played such an important role in Iberian heritage, either through blatant firework displays representing the siege of Lucus or the subtleties in Luso-Hispanic (and their ex-colonies) traditions, habits, vocabulary, and mannerisms with a Celto-Roman origin. Thank you for reading and be welcome to discuss this article on the FORVM!